This is going to be the first of a weekly series where I review the most recent episode of Star Wars Rebels. As a contributor to addisonrecorder.com, I’m writing reviews bi-weekly. Reviewing Rebels seems like a good way to keep exercising those skills I’m developing. I will do my best to avoid spoilers. Where I can’t avoid them, I will be sure to put a spoiler warning at the top of the article. The Phantom approaches the clones’ modified AT-TE. The second season proper of Star Wars Rebels wastes no time setting the stage for big conflicts and story arcs. Commander Sato’s fledgling rebellion is on the run from the Empire – the destruction of their flagship has left them too weak to fight. They need a hidden location to use as a base of operations. 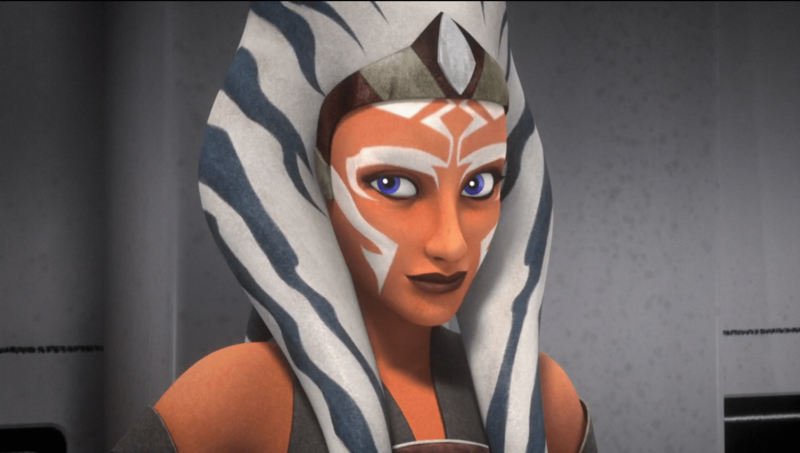 The crew of the Ghost is dispatched to find an old acquaintance of Ahsoka Tano’s who may know of such a place. This brings Kanan face to face with a trio of clone troopers, reminding him of the terrible events we saw in Kanan: The Last Padawan. Kanan doesn’t react well to the clones nor they to him. It will be a touch-and-go relationship. Ahsoka splits off from the fleet to investigate the mysterious Sith Lord Darth Vader. “There are questions. Questions that need answering,” she tells Kanan and Ezra. Lastly, the clones decline to join the Rebellion. Though he hates the Empire, Rex is weary of war and has no desire to get involved in another one. Ezra seems determined to change his mind. The episode if chock full of story, but it’s a bit light on action, moving along by dialogue. To its credit, the exposition is handled well by being featured in strong character moments. Freddie Prinze, Jr. turns in a stellar performance when Kanan breaks down and talks about Order 66 and why he distrusts the clones. Ezra continues to grow as a leader among the rebels – he took point on diplomacy with the clones and no one so much as batted an eye. He’s come a long way from the Loth-rat of a kid everyone picked on. The Ghost approaches orbit around Seelo. My only real complaint with this episode is that Hera was sidelined. The Ghost’s hyperdrive shorted out when they arrived in orbit around Seelos. She and Chopper remained aboard to fix it while the story happened dirtside. I hope it sets her up to be the hero next episode but for now it’s a bit irksome. 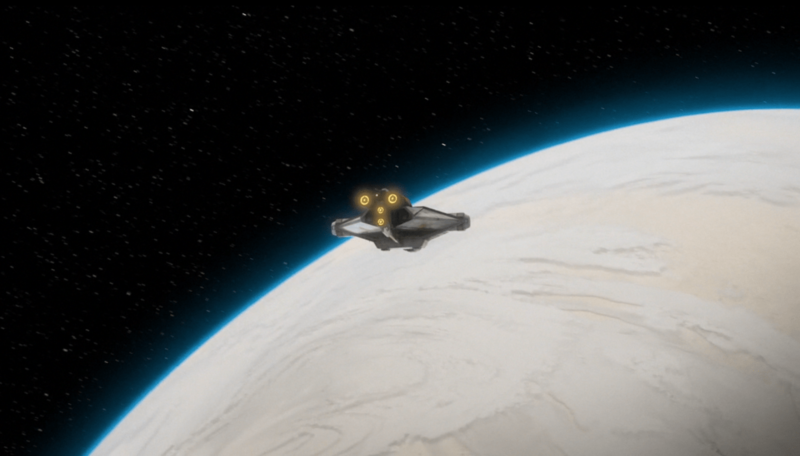 The animation of Rebels has always been beautiful. 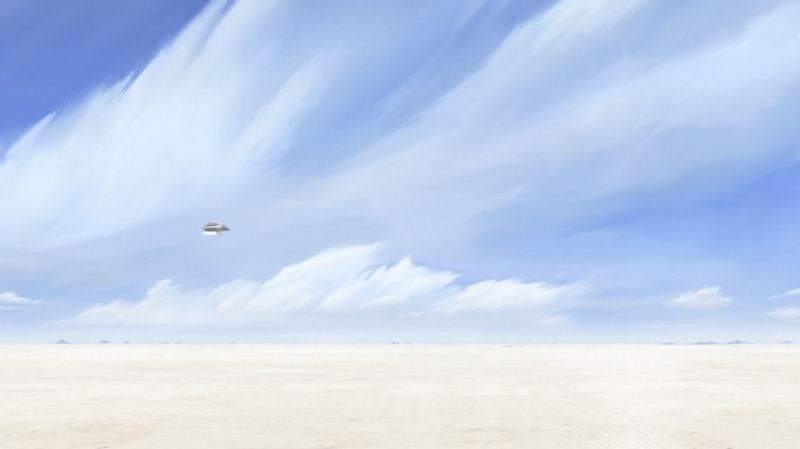 The sweeping majesty of the plains of Lothal, inspired by Ralph McQuarrie, are just sublime. What I appreciated in “The Lost Commanders” is the facial expressions. The animators are getting incredibly sophisticated with what they can do. Particularly with Ahsoka, we get some great, subtle moments conveyed only through facial expressions. It’s hard to believe that animation this complex can also be so subtle and affective. Ahsoka cracks a wry smile over Ezra’s exuberance. 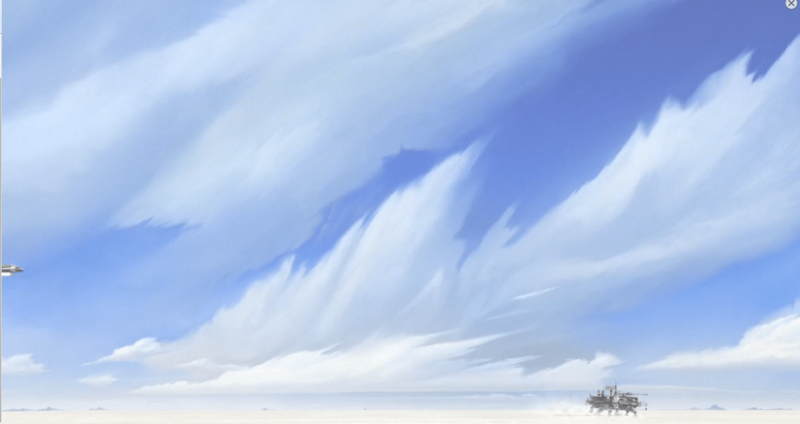 In addition, I’d like to nominate whomever draws the clouds in Rebels for a special Best Animation of Clouds Emmy award because, hot damn, have the clouds in both seasons been phenomenal. Last year we got the swirling, voluminous clouds of Lothal. Last night we got the wispy, stretched clouds of Seelos. I’ve paused multiple episodes just to look at the clouds. The clouds actually make the desert look kind of nice. This episode features a new desert planet – called Seelos – with blasted, cracked earth rather than the rolling dunes of Tatooine. There they seek the help of the desert dwelling nomads and must undergo a ritual involving the capture of an enormous worm, eventually winning the respect of those they came to find. It all sounds more than a bit like the first third of the book Dune – and since the episode ended with a “To be continued…” we may well have more Dune-inspired Star Wars ahead of us. Dave Filoni drew upon the cinema canon during The Clone Wars, entire story arcs are homages to classic films. I think we’re seeing a literary homage in “The Lost Commanders.” Granted, there have been several film adaptations of Dune over the years but the visuals on display more closely match the covers from the novel’s original publication in Analog. Filtered through a McQuarrie-esque sensibility, to be sure, but still reminiscent. 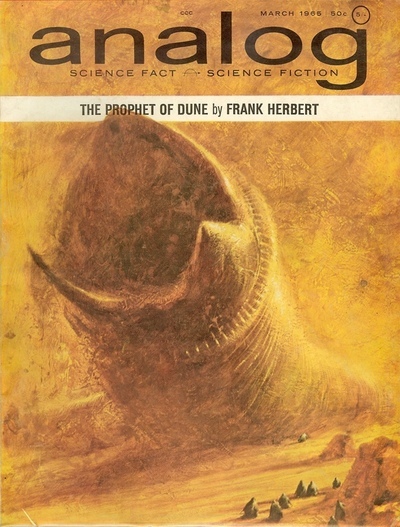 Frank Herbert’s Dune had an impact on the original Star Wars. Narrative similarities between the stories come from their similarly mythic storytelling. Both are a classic hero’s journey and feature a young man triumphing against impossible odds. Large portions of both stories take place upon a desert world inhabited by dangerous, mysterious nomads. There are even parallels between the Herbert’s Bene Gesserit and mentats and Lucas’ Jedi. I seem to recall an interview with George Lucas where he discussed the impact Dune had upon him but I can’t remember the specifics. The joopa “Big Bongo.” Kanan for scale. In the joopa hunting scene we were a single shouted, “Worm sign!” from Arrakis. Every space opera epic since Dune has needed a sandworm. Mass Effect has its Thresher Maws. Now Star Wars has the joopa (arguably, in addition to the space slug and the sarlaac). Beyond the cosmetic similarities, there are thematic ties to the sandworms of Dune. First is the space the joopa occupies in the narrative of the episode: the newcomers must prove their worth to the desert people in a trial of the worm. In Dune, of course, this is when Paul calls a great worm and uses his maker hooks to keep it from submerging so it can be used as a mount. Thus he is finally accepted fully as a Fremen. 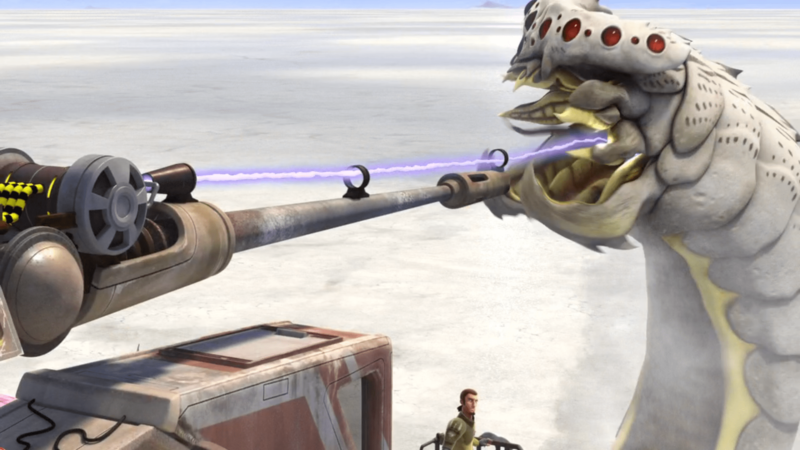 In Rebels, Ezra, Sabine, and Zeb all play key parts in bagging “Big Bongo” for Gregor. Ezra even uses a pair of staves to get Bongo to surface, in a corollary to Paul’s maker hooks. Second is the symbiotic nature between the desert people (the clones) and the worm. Gregor says that catching a joopa can feed them for a year – it’s a major food source and likely economic windfall for the clones. The Fremen in Dune worship the sandworms as gods and much of their culture is based around the massive creatures. The clones’ survival is as tied to the joopa as the Fremen’s survival is tied to the sandworm. If “The Clone Commanders” really is the first episode in an arc inspired by Dune, the next two episodes ought to be exciting. That’s when all the really crazy action and revelations happen. We all have to temper our enthusiasm, though. Our little band of Rebels isn’t about to topple the Empire and dethrone the Emperor the way Paul Muad’dib and the Fremen of Sietch Tabr did by the end of Dune. We know how that happens. This entry was posted in Rebels in Review, TV. Bookmark the permalink.